Illustrations of NetVizor in action on a network. The NetVizor client does the actual "work". The client is installed on each PC on your network and from there it records all relevant PC user activities, performs content filtering duties, and remote administration handling. The NetVizor viewer is the tool that helps tie all the NetVizor monitoring clients together so you can view computer activities, archive logs, perform remote installations, create network activity reports, and more. The viewer enumerates all workstations on your network being monitored by NetVizor - as well as roving users being tracked. 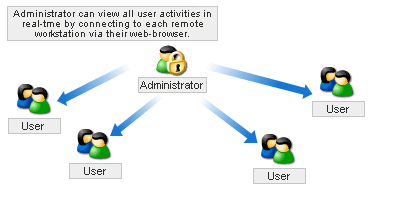 All you have to do is select a user or workstation and click the "View User Activity" button to view the user's activities on your network! NetVizor can be configured to store logs on a centralized server or computer on a network. This ability is beneficial in that logs are all stored on one PC for easy backup and retrieval. 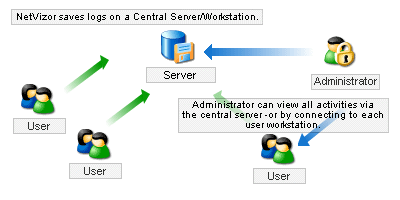 No logs are stored on workstations locally for users to discover, or stumble upon. While centralized log storage uses minimal bandwidth on the network to store logs, log storage is much more organized and secure. No logs are saved or copied on the local workstation being monitored. 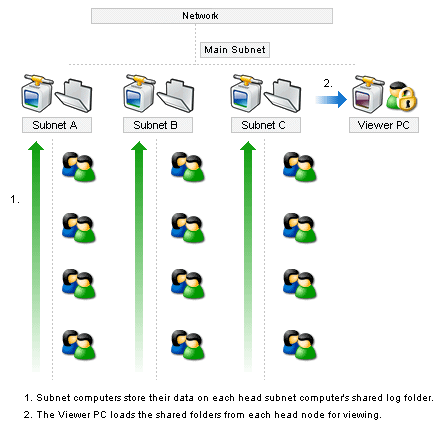 Centralized Log Storage also allows for the logging of multiple subnets not directly accessible to the viewing computer simply by adding the log storage locations on the subnet gateway computers to the viewer. In the example below, all NetVizor clients store logs on a shared log storage location at the head of their subnet. The NetVizor viewer software can then load all of these logs directly from each shared folder on the head subnet computers it has access to. NetVizor does not only focus on centralized monitoring, but centralized administration as well. NetVizor gives you the ability to perform remote security audits, remotely browse file systems on any workstation being monitored by NetVizor - as well as shutdown, restart, lock, and freeze workstations. NetVizor's remote administration features allow all activity logs to be viewed remotely, as well as specific system information - such as open network ports, network connections, temporary internet histories, and more! NetVizor gives the administrator the ability to remotely control what windows are open on the remote workstation, what applications are being used, and the option of actually viewing screenshots of the user's desktop in real-time. NetVizor can also show you a desktop screenshot of every workstation on your network in a tiled display with a single click.